In two weeks at Legaltech West Coast, Derek Bluford, CEO and founder of the California-based startup QuickLegal, will be featured during a lightning round on legal innovation. One topic not likely to come up during the panel is Bluford’s recent agreement to have a $559,330 judgment entered against him to settle a lawsuit charging him with impersonating a lawyer, forging legal documents and fraudulently swindling two clients. On Oct. 5, 2015, Superior Court Judge Raymond M. Cadei in Sacramento, Calif., entered the stipulated judgment against Bluford in favor of the married plaintiffs who turned to Bluford and another company of his, California Legal Pros, for help evicting a tenant from a home they owned in Discovery Bay, Calif., only to be defrauded out of more than half a million dollars. CEO of Legal Startup Responds to Yesterday’s Post. Case of Startup CEO Charged with Fraud Gets Curiouser. For a man who is still a year shy of his 30th birthday, Bluford has found success as an entrepreneur, first starting California Legal Pros (CLP), a company that markets various legal services to both consumers and lawyers. then QuickLegal, a service that provides on-demand legal advice to consumers, and then most recently QuickLegal Practice Management, a cloud practice management platform for lawyers. And on June 14 at Legaltech, Bluford will be featured alongside two other legal startups in a Legal Innovation Lightning Round produced by The Stanford Center for Legal Informatics (CodeX) and the Center for Legal Innovation at Vermont Law School and judged by CodeX fellows Monica Bay and Nicole Shanahan. But the allegations of the lawsuit (read the full complaint) paint an outrageous picture of a man who freely used fraud and deceit over 11 months in 2014 to take more than a half million dollars from unsuspecting clients who believed he was a lawyer looking out for their best interests. He deposited the money he took from them into the business bank accounts of California Legal Pros and QuickLegal, the complaint says. 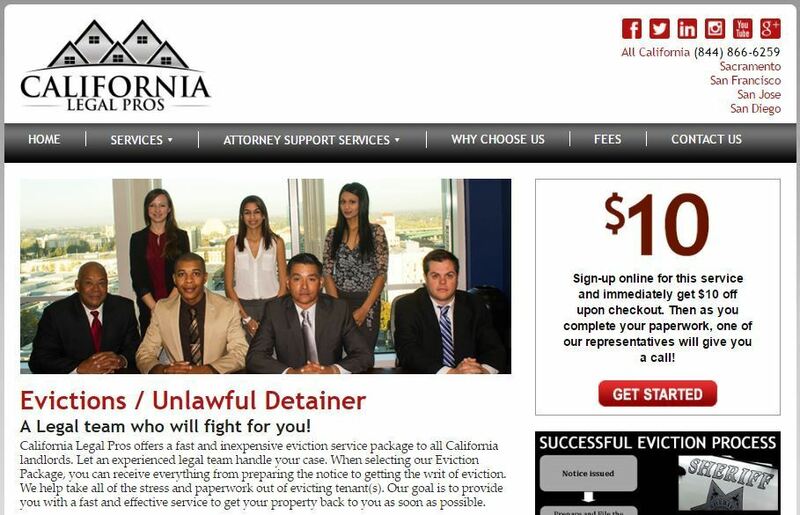 The complaint’s allegations center on Bluford and California Legal Pros, which includes among the services it offers an eviction package for California landlords. It was after seeing advertising and a web page for this package that the plaintiffs first came to CLP. After they telephoned CLP’s office in San Jose, the plaintiffs allege, they were emailed a packet of documents to sign and return. When they asked about representation in court, they say, they were told that CLP would appoint an attorney for them if needed. Subsequently, Bluford contacted them and told them that he was an attorney and the managing partner of CLP, their complaint alleges. He advised them that he would be handling their case and would appear in court for them if necessary. He falsely represented that the tenant had filed a claim for personal injury against the plaintiffs and then took $130,000 from the plaintiffs to settle the non-existent claim. He falsely represented that the county had fined plaintiffs $10,500 for a mold problem and took that money from them supposedly to pay the non-existent fine. He took $25,000 from the plaintiffs to remediate the supposed mold damage to their property and then took another $26,000 for the mold repair, saying the initial $25,000 was not enough. He took $244,000 from the plaintiffs plus $27,642 in “attorney fees” by forging court papers to make it look as though they owed fines to the city and county governments with regard to the mold in their property. He told plaintiffs that they needed to pay him $5,000 for time he spent at a nonexistent trial, and he then informed the plaintiffs that they had lost the trial and that the court had ordered them to pay $51,750. He later told them CLP had paid the judgment and would accept just $30,000 from the plaintiffs. He received another $7,200 from plaintiffs to cover the costs of filing a non-existent motion relating to insurance coverage and then another $3,237.50 for the same motion. He received another $30,000 from plaintiffs for a supposed “trial deposit” paid to a court. Throughout, he forged court papers and legal papers and repeatedly lied to plaintiffs. The plaintiffs finally became suspicious when they researched the judge who had supposedly issued several of the orders against them. When they found out no such judge existed, Bluford’s scheme quickly unraveled, according to the complaint. I attempted to speak with Bluford by leaving a message at his QuickLegal voicemail and by messaging him through Facebook but I received no response. I also emailed and telephoned Bluford’s attorney, Cyrus Zal of Folsom, Calif., and received no response. The attorney for the plaintiffs in the civil lawsuit, Daniel F. Pyne III of Hopkins & Carley in San Jose, Calif., emailed that he is traveling this week and could speak with me next week. Allow me to emphasize that the fact that Bluford settled this case and agreed to have judgment entered against him does not mean that he admits to the allegations of the complaint. To my mind, this is a cautionary tale for lawyers about using startup technology, particularly for something such as practice management that involves client information. Lawyers have an ethical duty to exercise reasonable care to protect the confidentiality and security of client information. That duty extends to selecting a technology. You need to do your due diligence and know who you are doing business with. Here, the allegations are that Bluford not only took money fraudulently, but that he then put his businesses at risk by depositing that money in the business’s bank accounts. If a lawyer was using one of those businesses, the lawyers’ own matters stored with that company could potentially be at risk. I am certainly not saying to avoid startups. But one factor to evaluate in selecting a company is its length of time in business and its reputation as a business. There’s an old maxim in journalism, “If your mother says she loves you, check it out.” The same holds true for the representations made by companies about their products and about themselves. It is your duty to check them out.